Milla Jovovich is angry. For some reason, an Umbrella security guard thinks he can take out this force of nature. Clearly, he made a mistake, as Milla does a quick circle kick and the guard flies backwards out of frame. While Milla looked angry during the shot, as soon as the cameras stopped rolling, the star of the Resident Evil franchise was all smiles and joking around with the crew on the set of the latest sequel, Resident Evil: Afterlife. While the studio and cast tried to keep a lot of the plot under wraps, we were able to learn the 4th Resident Evil movie is VERY influenced by the 5th video game. Apparently, writer/director Paul W.S. Anderson loved the game and used some of it when scripting the latest installment. From the way certain characters look to the way he’s filming some of the action scenes, he’s using the game as a template and fans of the series are going to be very happy when they see the movie. While Anderson directed the first Resident Evil and had been very involved in the sequels, this is his first time back in the director’s chair since the first film. While I don’t want to spoil everything in the movie, there is one action scene that sounded incredible that I have to share. Next week they are going to try and film an action scene that is going to have the camera going all around the actors while they’re fighting and the camera is even going to go under and on top of them. But while this is nothing new when filming an action scene, the goal is to try and edit all the shots together so it is one very long take with no cut. Since they haven’t shot it yet, they’re not 100% it’s going to work. But if it does, it’s definitely going to be a shot that everyone notices and talks about. From what I could gather, Anderson is copying the shot from the 5th game and he sounded very excited when talking about it. I hope they can edit it together as it sounded awesome. While I have a lot to say about this set visit, the one thing I really want to emphasize is how the 4th Resident Evil film is going to be a lot different than the first three films. What I learned yesterday is since this installment is in 3D, the way the action is choreographed and edited is tremendously different. That’s because if they tried to make the same kind of fast cutting Resident Evil movie in 3D, the audience would be sick after a few minutes. The reason is when you shoot in 3D, you have to be very careful the way you edit a movie and you have to make sure you don’t cut too fast or too often. What that means is the movie has to be completely thought out before you start to shoot. You can’t shoot extra coverage because of the time it takes with the 3D cameras. You can’t make up stuff as you go along because shooting in 3D already adds so much to the schedule. Also, when you are shooting in 3D, the actors have to hit certain marks and the action has to be very thought out or the shot has to be redone till everyone gets it right. From the way everyone spoke, while it’s a lot more challenging on every department and a lot slower for the actors, everyone is incredibly excited to see the end result. They all feel that if it cuts together, the movie is going to be well worth the added effort and headaches. Another interesting aspect of shooting 3D is filming dialogue scenes. Due to trying to use longer shots so you don’t have to cut, we found out director Paul W.S. Anderson added props and furniture to add depth to a long dialogue scene to make it a more interesting shot for 3D viewing. While I thought I knew a lot about making movies, I really did learn a great deal on this set visit. Making a 3D movie is radically different than a standard film and I can only imagine what the pioneers of our industry went through when they first started to make talkies (the first films with synch sound). As we spoke to all the technical people on set, they all talked about the challenges of making a 3D movie and how it presents a completely different list of obstacles to overcome. From set decorating to the paint used on props, filming in 3D adds an extra layer to every department. 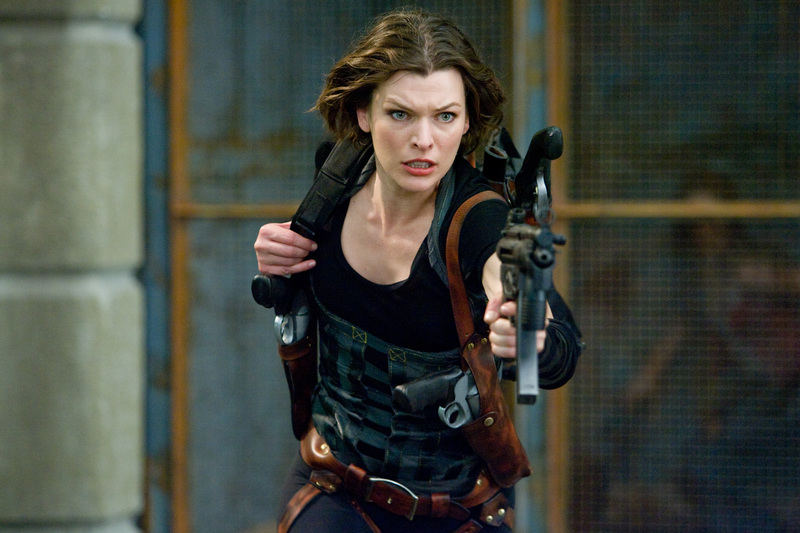 But enough about 3D and why it’s challenging….let’s get to what it’s like to visit the set of a Resident Evil movie! We started our day at 9am by meeting in the lobby of our hotel. After a short bus ride to the soundstages, about fifteen of us got seated in front of two 40 inch monitors so we could watch the playback from the other room. This happens a lot on movie sets, as journalists are never allowed to just stand where everyone is filming the entire time. While filmmakers and studios want us there, they also don’t want us seeing everything, so keeping us a bit removed maintains a bit of control and prevents us from learning too much. The first thing we were told was not to watch the monitors while they were setting up a shot. The reason is due to filming in 3D, the cameras are constantly being adjusted so the monitor has two cameras at different depths of field being displayed at the same time. Until they set up the shot and figure out how the 3D is going to look, everything is out of focus and a bit blurry, so looking at it for too long would result in a massive headache due to your eyes trying to process the two different images at the same time. So while they were setting up the shots, we constantly had people coming in and educating us about the challenges of filming in 3D and what was going on behind the scenes. We spoke to the producer, editor, make-up department, props people, the wire work expert, prosthetics people, set decorators, and everyone else you could imagine. While I could run tons of quotes and make this article 10 pages long, I’ve boiled down some of the most interesting things I learned into some bullet points. – Paco Fischer is doing the 3D. He worked on Avatar and they are using the same cameras on Resident Evil. While these cameras added some cost to the shoot, they thought they were the best. – They are lucky to get 12-15 set ups in a day. – They are using the phantom camera. It can shoot 24 frames a second and it can all shoot high speed. – Everyone was raving about what this camera can do. – We were on set for day 35 of 55. 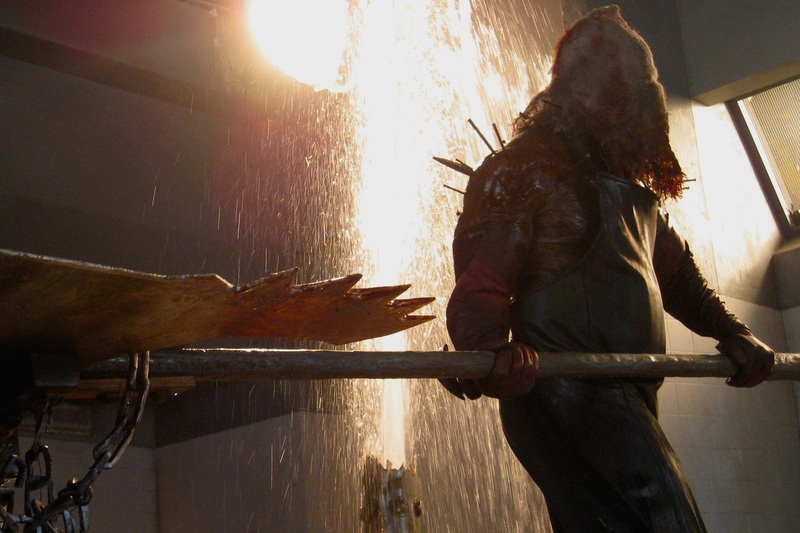 – There are three types of zombies in the film: underwater zombies, burrowing zombies and Los Angeles zombies. After meeting with a lot of the key production people, we went upstairs to the production offices to see the production designer. As we walked into a huge room, the walls were covered with production artwork and there were tables filled with mock ups of filming locations. Some of the locations were labeled “int. Umbrella control pod”, “int. Umbrella entrance”, and “ext. Umbrella facility”. But while the walls were filled with cool artwork and we got to see how they were going to use certain real locations in Toronto as part of the Umbrella Corporation, the cool thing for fans of the video game were the game characters on the wall. On one of the walls I saw tons of stuff on Resident Evil 5 and they had Albert Walker, Chris Redfield, executioner, Majini, and the dogs as character portraits. If I were a betting man, I’d say all of them are in the movie. But since we had limited time in the office and so much to see, I couldn’t follow up with many questions on the characters. However, when we did interviews later in the day, we learned a great deal about the other characters in the film and some of the action scenes. Make sure to read the interviews! The first thing we got to watch was a scene featuring Shawn Roberts as Albert Wesker. The scene takes place in an Umbrella corporation building and it’s an all white room. The chairs are white, the walls are white, everything is white. But in stark contrast to this white room is Shawn Roberts. He’s dressed in all black and he even has black sunglasses on. If I had to compare his look to another film, he’s a bit of a mix between Neo and agent Smith in The Matrix. The shot we saw had Roberts sitting in the all white chair and he’s starts by looking at something. All of a sudden he quickly moves his head to his left (our right) and it looks like he is dodging something that we can’t see. We watch as he repeats this shot a few times. A bit later on we finally understand what the shot is as someone has placed 7 knives in the chair right next to where he is sitting. All of a sudden it’s pretty clear we are watching part of a battle scene between Alice (Milla Jovovich) and Albert Wesker (Shawn Roberts) and we all start to wonder if this is part of the finale of the movie. After Shawn had his turn filming, we got to see Milla as Alice performing some stunts and reacting to some imaginary zombie dogs in the same all white room. The first thing we watched Milla do was a circle kick on a stunt guy that had him fly backwards in the frame. Later on, we watched as Milla walked through another part of the room and next to her were six dead bodies that the umbrella corporation must have worked on. The bodies looked like mannequins you’d see in a store window except they were missing body parts. I believe someone said they’d be amplified by CG for the film. The next part we saw is going to make fans of the Resident Evil franchise very excited. In this sequel, Alice encounters some zombie dogs that have tentacles coming out of their mouths! While things might change for the final film, we saw some test versions of the dogs on set and the mouth opens up in a massive way. Imagine a crocodile mouth, turn it 90 degrees so it opens left and right rather than up and down, and put it on a very large dog! If the final version is anything like what we saw, it’s going to be one of those awesome 3D moments in the film. Here’s how the scene unfolded: Milla is walking near the six dead bodies. She is curious. All of a sudden she starts to back away as she starts to react to the dogs. While I don’t know exactly what happens next, either she takes control of the dogs and says, “I told you I’d be bringing some friends”, or she gets the dogs to do something else. I don’t know. It’s also possible we were watching two different scenes unfold. The thing is, while the studios want you there to write about the movie, they never want to tell you everything. So here’s where it gets interesting….I asked someone on set where these scenes takes place in the film and they said half way in the movie. I then spoke to someone else who let it slip that it’s the finale of the film. The way the set looked and the fact they are going to spend six days shooting in this location leads me to believe we were watching the finale get filmed. I think they were trying to not let it slip exactly what we were watching, but with the way the dogs are going to look, and how cool the set was, I’m 99% sure it was the finale. Also, it felt like the end scene in a video game where you have to fight the final boss. While I can appreciate the Resident Evil movies for what they are, none of them were movies I was really looking forward to before they came out. I was cool with watching them, but they weren’t must see films, like a Spider-Man or an Iron Man. But I have to say, after watching the action unfold on set yesterday, I’m genuinely excited to see this film. Everyone involved seems like they were working extremely hard to make this the best Resident Evil yet and the 3D seems like it’s going to really add a lot to this franchise. And with that, I hope you enjoyed my set report and learned a little bit about the way 3D movies are made. I know I did. Finally, a big thank you to our partners at Omelete for sending me to Toronto. Much appreciated.